The Chicago Cubs are still alive. If Game 4 was Jake Arrieta’s last start in front of the Wrigley Field faithful, he certainly went out in style, striking out nine while allowing just one run over 6.2 innings. He managed to cool down a Dodgers lineup that has been scorching hot throughout the postseason, and if nothing else, helped the Cubs avoid an embarrassing sweep in the NLCS for the second time in three years. The Cubs now have the privilege of hosting Game 5 on Thursday night, giving them a chance to put some actual pressure on the Dodgers and force the series back to Los Angeles with a win. The Cubs have forced a Game 5, but now the question is whether Chicago has woken up offensively or if Game 4 was an aberration. Clearly, the Cubs have the starting pitching to stay alive in this series, but the bullpen has been an issue at times and the Cubs have never gotten on track offensively. Albert Almora Jr. and Willson Contreras are the only Cubs position players who are hitting over .200 in the postseason. 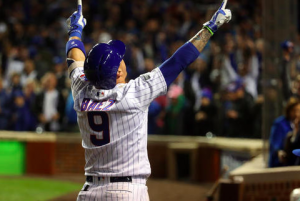 Javier Baez finally showed signs of life in Game 4, hitting two home runs that were his first two hits of the entire playoffs. However, the trio of Kyle Schwarber, Kris Bryant, and Anthony Rizzo all went hitless in Game 4. As long as those types of players stay quiet, it’s hard to say that Chicago’s offense has woken up. It won’t get any easier in Game 5, as the Dodgers go back to the top of the rotation with Clayton Kershaw. Of course, Kershaw has continued to be hittable during the postseason. The Cubs managed two runs against him in Game 1, including a home run from Almora. Nevertheless, Kershaw will be in a good position to neutralize many of the left-handed bats in Chicago’s lineup, so it could be up to Bryant, Contreras, Baez, and Addison Russell to do some damage against Kershaw and force him out early. Meanwhile, the Cubs will go back to Jose Quintana, who matched Kershaw in Game 1 by allowing two runs over five innings. Over 11.1 innings this postseason, Quintana has a 1.59 ERA, so he has clearly responded well to being on the playoff stage. However, the Cubs are going to need more than five innings out of him in Game 5. Chicago’s bullpen isn’t the most trustworthy, and after Wade Davis pitched two innings and threw 48 pitches in Game 4, his availability for Game 5 is uncertain. The Cubs may need at least seven strong innings from Quintana if they’re going to have a chance in Game 5. The biggest X-factor in Game 5 may be Anthony Rizzo. He’s typically one of the players the Cubs rely on the most, but he’s struggled to get going offensively during the playoffs. In four games against the Dodgers, he’s just 1 for 13 with eight strikeouts. Facing Kershaw wouldn’t seem to make things much easier for him. However, prior to the postseason, he was 5 for 14 (.357) with two home runs and a double in his career against Kershaw. Rizzo has had success against Kershaw in the past and could give the Cubs an unexpected lift early in Game 5. It was nice for the Cubs to get a win and avoid the sweep, but this is the end of the line. Chicago’s bats haven’t shown enough signs of life, and there’s simply too much working against them to believe that they can force the series back to Los Angeles. Dodgers win 6-2.